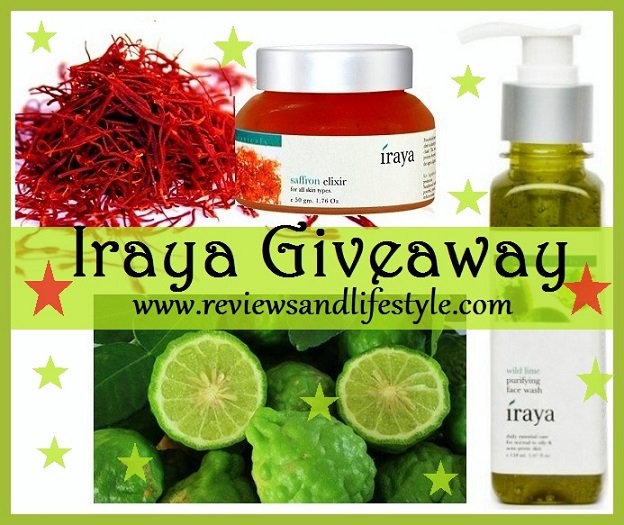 Iraya Summer Skin care Giveaway. 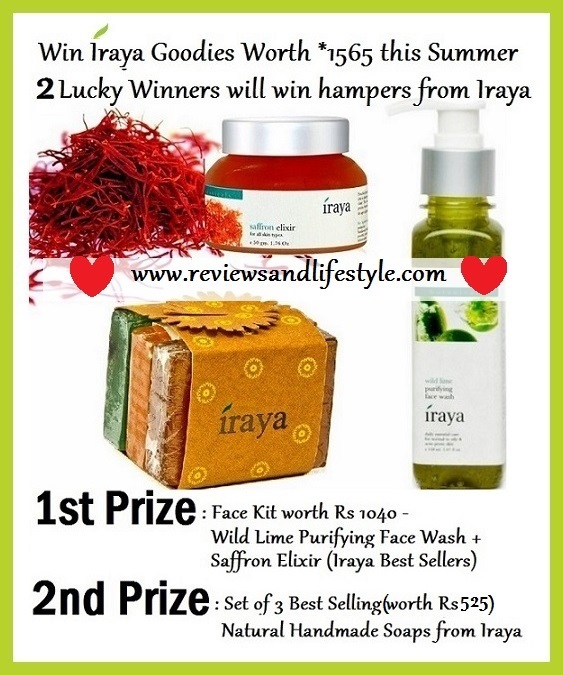 Win Iraya Gift Hampers. Honest Reviews and Lifestyle Tips is happy to announce a Summer Giveaway sponsored by the Ayurvedic Hair and Skin Care brand Iraya. Iraya in Sanskrit means "from the earth". The brand was born with the belief that the path to beauty and wellness is through the harmony and balance of the mind and body with the soul. So Iraya's range comprises of products that believe in nature's own healing process bestowing complete wellness and lasting beauty from within. Iraya's Product Range includes: Ayurveda, Botanicals, Bath & shower, Spa at Home, Fresh natural cosmetics, Cosmeceutical and Wellness products. First winner will get a Face Kit worth Rs 1040 from their 'Botanicals' product line. The Kit comprises of Iraya Saffron Elixir worth Rs 695 (from their Botanicals range) and Iraya Wild Lime Purifying Face Wash worth Rs 345. I too am currently using the Iraya Saffron Elixir and it's amazing. 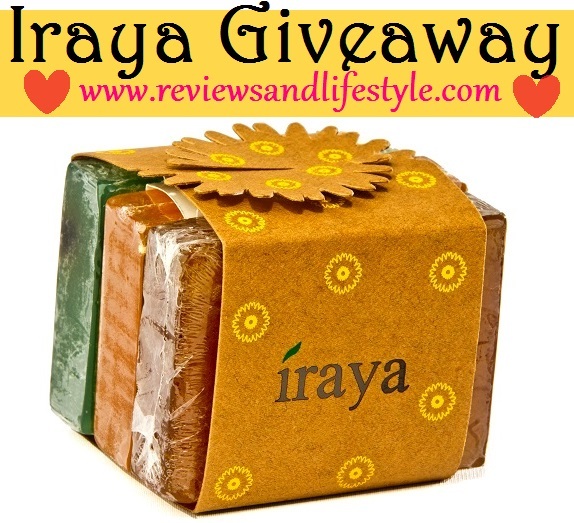 The Second winner will get a set of three best selling Natural Handmade Soaps worth Rs 525 from Iraya. These soaps are from Iraya's 'Bath & Shower' product line. 1. Like Iraya Facebook Page. 2. Like Honest Reviews and Lifestyle Tips Facebook page. 3. Share the giveaway publically on your wall and tag/invite friends family. Make sure to Honest Reviews and Lifestyle Tips and Iraya Facebook page on the post. 4. Follow my blog through email. You will receive an email with activation link. Please check your inbox as well as spam folders. People who do not activate the subscription will be disqualified. 5. Leave a sensible comment on any two of my articles and tell me in comments which article. 6. Once all the steps are done, comment below with your proper name/Google profile and let me know your details. 1. Giveaway is open for approx 2 weeks. Start date June 16, 2014. Ends on June 30, 2014. 2. Open to anyone 16 years or above and who has an address in India to receive the prize. 4. Results will be announced by Jul 5, 2014 or before and email will be sent out to the winners. 5. Failing to reply within 48 hours of email, a new winner will be picked up through random.org. 6. People who tag and invite regularly and bring more followers for both Iraya and HRLT (Honest Reviews and Lifestyle Tips) will be alloted an extra entry. 7. Please come back and check this page for any message or comment from me regarding your participation entry. Hope to see good participation as the rules are really easy and the prizes are extremely tempting. Dear Sneha, thanks for participating. The comment on the hygiene wash was incoherent and I couldn't understand it. So I didn't publish. Can you please leave one more genuine comment in not so hurry so it makes sense while reading? I would appreciate that :) Thanks. Hmmmm did you read what I wrote in the comment? You are still not eligible till the time you don't write a second comment. The one you wrote did not make any sense as it was full of spelling mistakes. Please try not to to finish the steps in such hurry dear. Thanks for completing the steps Sneha. Your Entry # is 1. Hi gagan ! very luring offer ..... i think i completed all the steps ... i shared the giveaway on my wall, rest has been done in the past .... am i eligible to participate ? Yes my dear. I have seen your other comment also below. You have completed all the steps. Thanks for participating and showing good support and spirit. All the best. Entry # 2. Articles: Patanjali Beauty cream & shapes of eyebrows! Thanks for participating Megha and I know you love Iraya products too :) Your Entry # is 3. Hello di. I have completed all the steps. I have posted comments on aloe vera hair mask post, make natural loofah at home post & TBS body polish review. Congratulations on winning in the Soulflower and the JoybyNature giveaways. Your participation spirit is an inspiration and adds life to any giveaway. All the best. Entry # 5.
so nice of u Gagan that u value my participation so much !! Hello Gagan, thanks for the giveaway. Participating for fist time. Shared this giveaway , tagged my friends . Liked Iraaya & Honest Reviews and Lifestyle Tips on Facebook. hi gagan ! completed all the steps. left comments on tejus beauty cream and mehendi indigo article. so, did i do the right job ?...... hope i did .... lots of love for all the commendable efforts you put in ! Thanks for the Continous Super duper giveaways! i wish to win in any of them :) doing my best via sharing! done..wish to win here!! never won!! Sorry I can't find your email ID in email Subscriptions and you haven't done step 5. I am a powerful mind, soaring high on the wings of creativity, supported by the strong winds of knowledge. I try, I fall, I try I succeed, I try, I experience; I experience, I learn; I learn, I share; I share, I feel happy. - so nice lines by you!! you inspired me too!! Thanks so very much!! Congratulations on making a hit in the other 2 giveaways Kavita :) Your prizes are on the way. Thanks for participating in all. Entry # 10. All the best. My comments on the superb articles here! Entry assigned above :) Thanks for completing the steps. Thanks for participating Bidisha. Entry # 11. I'm participating in the first ever giveaway today. Participated in the giveaway today. and have shared the Iraya giveaway on my facebook timeline. Rest all the steps have been done already. and thanks for the giveaways you keep organizing. Hi Gaganpreet I have been posting comments on products that interest me and was able to procure. But to be safer I have posted on your article on Iraya Body Lotion and Vedic Line Hair Retarder. Am Ranjana Lal and my posts are by this name only. I have already liked both the pages on FB. And have shared the giveaway on my FB timeline. I do recieve emails from you. Glad you made it to this one as you had missed the other giveaways during your shifting. Thanks for your support and the meaningful feedback you share on my product reviews. Wish you all the best. Entry # 16.